Penny and Buck decided to mix things up a bit and run a special on vinyl. $5 for a pack of 10 stickers. Click the image to navigate to our ordering instructions. Anybody Want a Free Ocean Beach Bum patch? It’s an iron-on and looks exactly like the sticker, maybe better. Just send your name and mailing address to penny@iheartbums.com, and I’ll put one in the mail for you today! Free patches while supplies last. Number 1 Seller in Seattle, Portland, San Francisco, Santa Cruz, Santa Barbara, Las Vegas, Hollywood, and Venice Beach. 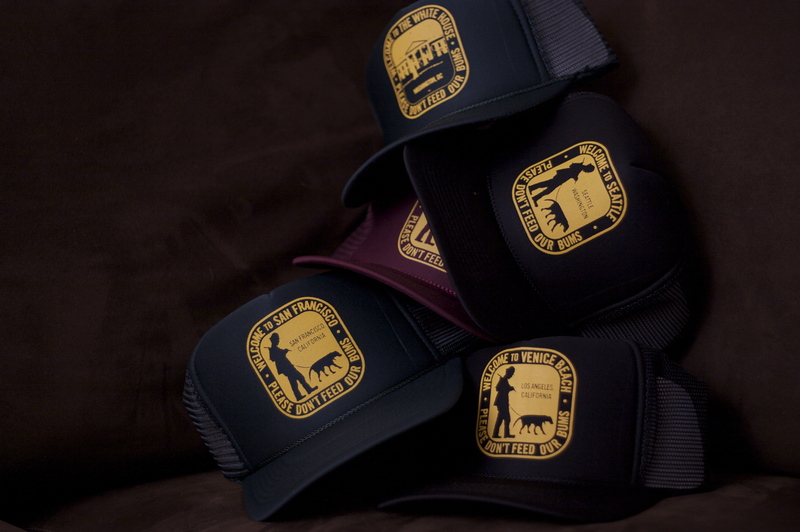 If you live in, or just love, a bummy city on the West Coast, chances are we’ve got a hat for you. Due to popular demand, the “Please Don’t Feed Our Bums” message has expanded from little ol’ Ocean Beach to Seattle, Portland, San Francisco, Santa Cruz, Santa Barbara, Las Vegas, Hollywood, Venice Beach, The White House, and Capitol Hill. Click here to order. Frank, the proprietor of the O.B. Rag of Lemon Grove, Calif.
Buck has heard rumors that a new bum sticker exists—not the “Tolerance” sticker or even the “Please Don’t Feed Our Bums” sticker—this new little gem reads: “Welcome to O.B., Please Don’t Feed Frank.” As some of you may remember, Frank Gormlie is the proprietor of a blog called The O.B. Rag. 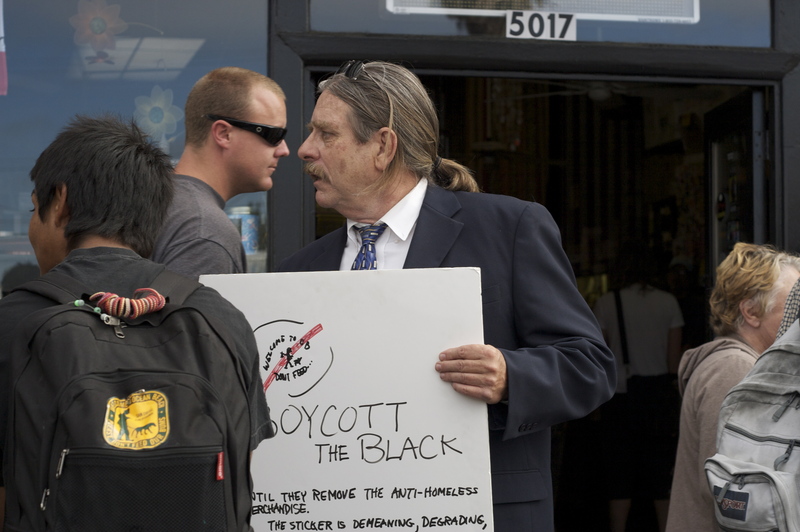 He organized the protests held outside the Black in Ocean Beach, went on KPBS a number of times, and basically, let everyone who wanted a “Please Don’t Feed Our Bums” sticker know where they could purchase one. Penny and Buck, by the way, want to send Frank a late, but sincere “Thank you, Frank,” for publicizing the sticker to the extent that he did. So far, the Black has sold 9,000 stickers. 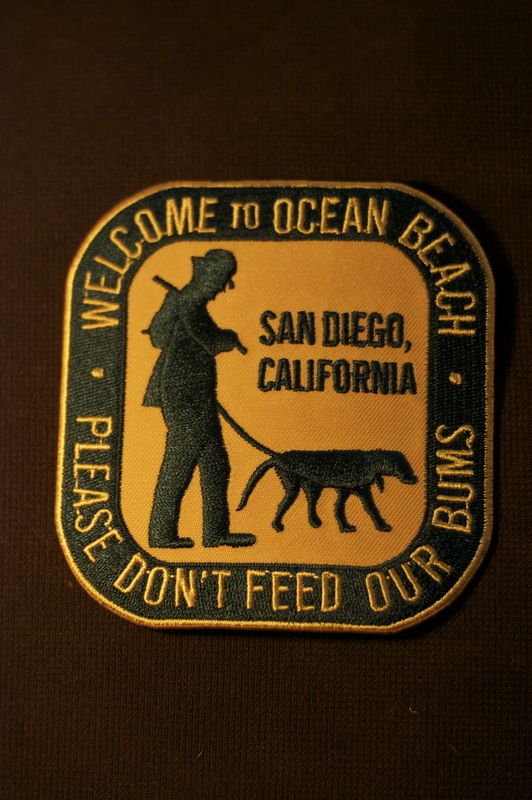 Frank’s hard work in getting the news of the bum sticker out to media outlets has also helped spawn a few reactionary stickers, including the “Ocean Beach Mobile Homes” sticker described below. The Frank Gormlie sticker, is the one Penny and Buck really want. If anyone out there knows where we can get one, we’ll trade for a hat or t-shirt for it. 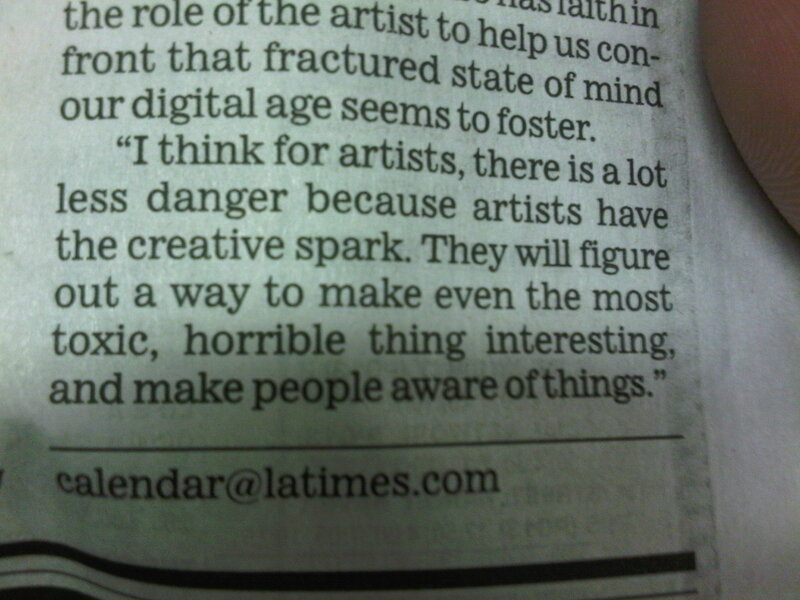 Keep your eyes peeled. 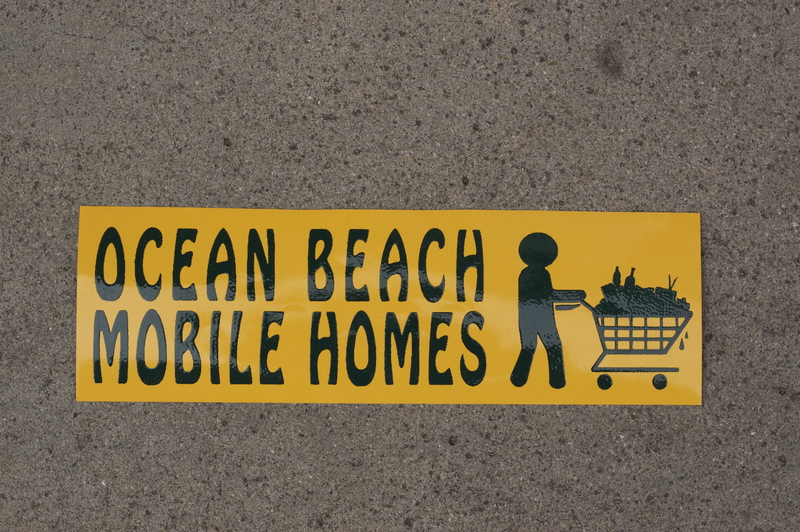 Penny just bought this sticker, “Ocean Beach Mobile Homes,” from a bum on Newport Ave. It portrays a stick figure pushing a loaded shopping cart. Check out the booze bottles and TV set in the cart. Classic. Its printed in the same colors as Penny’s sticker. Luckily, Penny believes that imitation is the purest form of flattery. If you want one for yourself, the guy selling them is still down on Newport in front of Hodads. Hurry up and get down there, the guy might load up his cart and skidaddle. Tell ’em Penny and Buck sent ya. Bum sticker spin-offs are awesome. P.S. Penny and Buck are making a stencil for free download so anyone who wants to post up a “Please Don’t Feed Our Bums” image can pop ’em off anywhere they want. Keep an eye out for the stencil on this page. Dog Town down with bum stickers. The “Welcome to Venice Beach, Please Don’t Feed Our Bums” sticker found a good home in Venice Beach, at Venice Skateboarding Stuff located smack in the heart of the boardwalk, phone: 310.314.5230. Skaters know their streets and they know satire—and as proven by Dog Town and Z-Boys, skaters have been shaping culture for 40 years. So obviously, Penny and Buck we’re honored to join the Venice tagging tradition and receive such a cool vibe from Venice Beach skaters and artists. P.S. We heart Venice bums too . . . er . . . wait a minute. We heart Venice Beach. Tagging is a Venice Beach art form.